Bethlem myopathy (BM) and Ullrich congenital muscular dystrophy (UCMD) are due to mutations in the genes encoding collagen VI subunits which are the important components of the extracellular matrix. , UCMD has autosomal recessive inheritance with severe phenotype whereas BM is autosomal dominant, relatively benign, and is characterized by slowly progressive myopathy, flexion contractures of joints, hypermobility of interphalangeal joints, keloid formation, and follicular hyeprkeratosis. Though respiratory muscle involvement can occur in late stages of BM, cardiac involvement is uncommon. Diagnosis of BM is based on clinical features, molecular diagnosis, and immmunostaining for collagen VI in muscle and skin fibroblast cultures. ,,, The prevalence of BM is 0.77 per 100,000 and that of UCMD is 0.13 per 100,000. We report three male patients from a single family with clinical phenotype of BM. The proband was a 45-year-old teacher born of non-consanguineous parentage presenting with recurrent falls since the age of 10 years. His mental and motor milestones were normal. He noticed predominantly proximal weakness of all four limbs and continued to perform his daily activities without assistance. He had difficulty in climbing stairs and rising from the floor. He had sustained multiple injuries from recurrent falls resulting in multiple keloids over sites of injury. The weakness progressed very slowly till 40 years of age after which the weakness progressed more rapidly and he stopped riding a two-wheeler. One month prior to admission he developed cough, breathlessness with worsening of weakness which prevented him from attending work and became dependent for activities of daily life. On examination, he was breathless with 24 breaths per minute. Cardiovascular examination was normal. 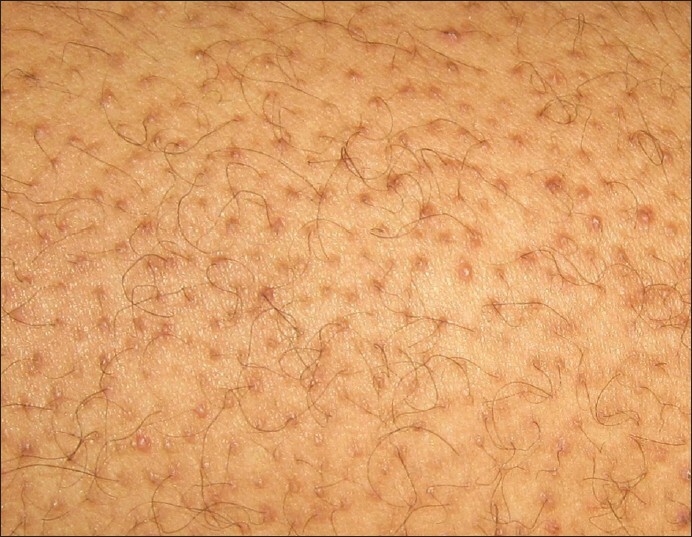 There were multiple keloids over chest and both feet [Figure 1] along with follicular hyperkeratosis [Figure 2]. Contractures were noted at elbow, knee, hip, and ankle with hyperextensibility of fingers. He was alert with normal mental functions and cranial nerves function. Neck muscles were mildly weak with symmetrical quadriparesis (Medical Research Council grade 2 to 3/5 proximally and 4/5 distally) with atrophy of proximal muscles. Sensations were intact and muscle stretch reflexes were absent. Contractures were noted at elbow, knee, hip, and ankle with distal hyperextensibility of fingers. He succumbed to respiratory insufficiency few weeks after discharge. Both his sons too presented with predominant proximal muscle weakness of all four limbs. Elder son was 20-years-old with symptom onset at 7 years of age. He had recurrent falls with infected keloids over both feet that had been excised. He needed maximum help to stand and could walk with difficulty. The second son was 18-years-old with onset at 9 years of age. He had mild proximal weakness of all four limbs and had occasional falls. He was independent for activities of daily life. Both had high arched palate, follicular hyperkeratosis and proximal dominant quadriparesis with flexion contractures involving elbow, knee, and ankles with distal hyperextensibility of fingers. Higher mental functions were normal in all the three patients. There was no history of similar illness in any of the family members traced back to four generations [Figure 3]. Electrocardiography and echocardiography were normal in all the three patients. Muscle enzymes were normal in the father, and mildly elevated in both children. Needle electromyography in father and the elder son revealed myopathic features with normal nerve conduction studies. Left biceps brachii muscle biopsy in the father revealed effaced architecture with fibrosis, adipose tissue infiltration, rounding of muscle fibers, increased variability of fiber diameter and myonecrosis. Myophagocytosis with few regenerating fibers in addition to mild perivascular inflammation was seen [Figure 4]. Enzyme histochemistry revealed numerous lobulated fibers and type I fiber predominance. A few ragged fibers were noted on modified Gomori trichrome. Immunostaining with monoclonal antibodies against collagen VI A1, dysferlin, and sarcoglycans (α, β, γ, and δ) revealed normal staining pattern [Figure 5]. Magnetic resonance imaging (MRI) of the thigh muscles revealed selective involvement of anterior thigh muscles in the father. Computerized tomography (CT) of thigh in the elder son revealed preferential involvement of vasti and glutei compared to the hamstrings, adductors, and sartorius. There was central hypodensity in rectus femoris suggestive of "central shadow" sign [Figure 6]. We describe a family with classical phenotype of BM with keloids, follicular hyperkeratosis, and characteristic findings on muscle imaging. BM is a rare disease presenting with early onset myopathy and disabling contractures and tendency to keloid formation. It is grouped under collagenopathies with mutations of collagen VI encoding genes. ,, Myopathy with contractures is seen in Emery Dreifuss muscular dystrophy (EDMD), Xp21 myopathy, early onset limb girdle muscular dystrophy, congenital muscular dystrophy, BM, and UCMD. BM was described by Bethlem and Wijngaarden in 1976 in 28 affected members from three families. UCMD and BM form two ends of clinical spectrum of collagenopathies with UCMD having severe manifestations. UCMD patients have severe muscle weakness progressing to respiratory insufficiency, velvety skin, and posteriorly prominent calcanei. The characteristic common phenotypes of these two disorders include flexion contractures, keloid formation, follicular hyperkeratosis, and predominantly proximal myopathy. Our patients had childhood onset autosomal dominant proximal myopathy with relatively benign course and multiple keloids conforming to the clinical criteria of the European Neuromuscular Centre Bethlem Consortium. Though BM is inherited as autosomal dominant and UCMD as autosomal recessive, heterogeneous inheritance has also been described in both the conditions. Common differential diagnosis of BM include autosomal dominant form of EDMD2 due to mutations in lamin A gene, as the latter disease also has early contractures with humeroperoneal weakness. Presence of dilated cardiomyopathy and conduction defects in EDMD2 differentiate it from BM. Patients with BM are known to have an early onset hypotonia, dynamic contractures, and a relatively prolonged benign course. Half the patients are reported to attain wheelchair-bound state by fifth decade of life. The more severe forms of BM may develop respiratory insufficiency. Our proband had progressed to severe disability in fifth decade and succumbed to respiratory insufficiency as in markedly progressive Bethlem phenotypes. Three members from two different families presenting with characteristic features of BM and muscle biopsy findings were reported earlier from India. We report another family with Bethlem phenotype, pattern of muscle involvement on imaging, enzyme histochemistry with immunostaining for collagen VI in muscle biopsy from Indian subcontinent. BM is a rare disease presenting with early onset myopathy and disabling contractures, with tendency to keloid formation. It is grouped under collagenopathies with mutations of collagen VI encoding genes. 1. Pace RA, Peat RA, Baker NL, Zamurs L, Mörgelin M, Irving M, et al. Collagen VI glycine mutations: Perturbed assembly and a spectrum of clinical severity. Ann Neurol 2008;64:294-303. 2. Weil D, Mattei MG, Passage E, N'Guyen VC, Pribula-Conway D, Mann K, et al. Cloning and chromosomal localization of human genes encoding the three chains of type VI collagen. Am J Hum Genet 1988;42:435-45. 3. Hicks D, Lampe AK, Barresi R, Charlton R, Fiorillo C, Bonnemann CG, et al. A refined diagnostic algorithm for Bethlem myopathy. Neurology 2008;70:1192-9. 4. Jöbsis GJ, Boers JM, Barth PG, de Visser M. Bethlem myopathy: A slowly progressive congenital muscular dystrophy with contractures. Brain 1999;122:649-55. 5. Briñas L, Richard P, Quijano-Roy S, Gartioux C, Ledeuil C, Lacène E, et al. Early onset collagen VI myopathies: Genetic and clinical correlations. Ann Neurol 2010;68:511-20. 6. Lampe AK, Bushby KM. Collagen VI related muscle disorders. J Med Genet 2005;42:673-85. 7. Lampe AK, Dunn DM, von Niederhausern AC, Hamil C, Aoyagi A, Laval SH, et al. Automated genomic sequence analysis of the three collagen VI genes: Applications to Ullrich congenital muscular dystrophy and Bethlem myopathy. J Med Genet 2005;42:108-20. 8. Norwood FL, Harling C, Chinnery PF, Eagle M, Bushby K, Straub V. Prevalence of genetic muscle disease in Northern England: In-depth analysis of a muscle clinic population. Brain 2009;132:3175-86. 9. Deconinck N, Stojkovic T. Ullrich congenital dystrophy and Bethlem myopathy: Current knowledge on the clinical spectrum, pathogenesis, and future therapeutic avenues of collagen VI related muscular dystrophies. Curr Pediatr Rev 2009;5:28-35. 10. Bethlem J, Wijngaarden GK. 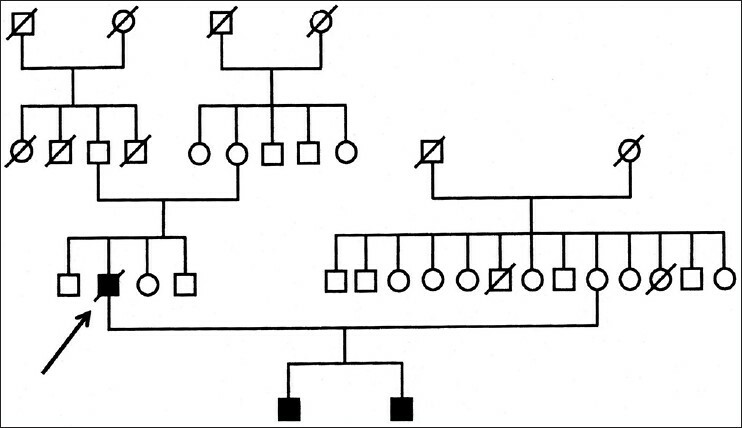 Benign myopathy, with autosomal dominant inheritance: A report on three pedigrees. Brain 1976;99:91-100. 11. Pepe G, de Visser M, Bertini E, Bushby K, Vanegas OC, Chu ML, et al. Bethlem myopathy (BETHLEM) 86 th ENMC international workshop, 10-11 November 2000, Naarden, The Netherlands. Neuromuscul Disord 2002;12:296-305. 12. Gualandi F, Urciuolo A, Martoni E, Sabatelli P, Squarzoni S, Bovolenta M, et al. Autosomal recessive Bethlem myopathy. Neurology 2009;73:1883-91. 13. Mercuri E, Clements E, Offiah A, Pichiecchio A, Vasco G, Bianco F, et al. Muscle magnetic resonance imaging involvement in muscular dystrophies with rigidity of the spine. Ann Neurol 2010;67:201-8. 14. Deconinck N, Dion E, Ben Yaou R, Ferreiro A, Eymard B, Briñas L, et al. 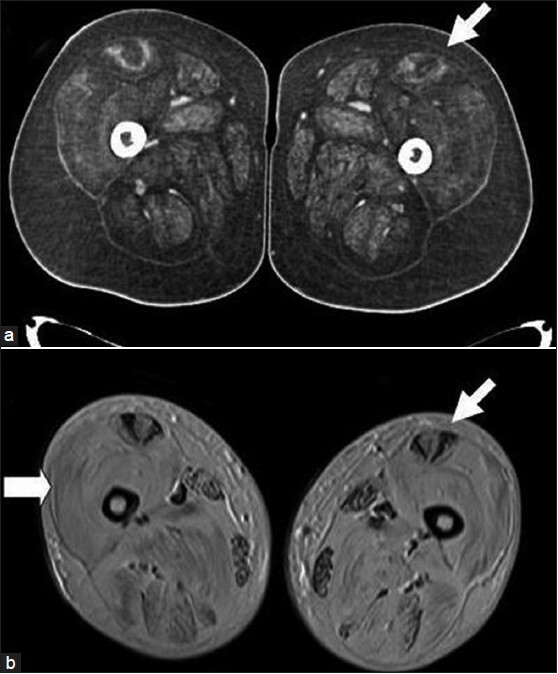 Differentiating Emery-Dreifuss muscular dystrophy and collagen VI-related myopathies using a specific CT scanner pattern. Neuromuscul Disord 2010;20:517-23. 15. Nalini A, Gayathri N. Bethlem myopathy: A study of two families. Neurol India 2010;58:665-6.